I have to admit I missed a day here. The Twilight midnight screening took so much out of me that I was a shell of my usual self yesterday. When I got home from school, which I went to after only 3 hours sleep, we had Amanda's friends over for a little birthday celebration. I ended up putting the movie in around 6:30 and waking up around 9:00. Yep, I fell asleep. At that point I did not have the energy to go back and watch the two-thirds of the movie that I had missed. There would also have been no way for me to blog on the film, either, I would have passed out a second time. Now that the apology is out of the way, let's get to the movie. I read that the Character "Gator" is based on the same character from "White Lightning" three years earlier. I have that movie on my list also, but I have not yet obtained it so I'm going to go out of sequence. I am telling you it doesn't matter that we are starting with the second movie, because as far as I could tell, there were no story elements carried over from the first movie except the main character. This movie easily stands alone as a comedy/action film. 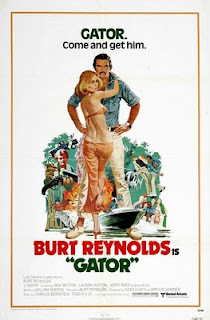 It is the first feature that the star, Burt Reynolds, directed. You can tell that it is a first effort in a number of ways. The pacing is not very crisp, there are some long passages where pretty much nothing happens. Occasionally there is a pretty shot that the director lingers over because he is so satisfied with the image, he wants you to notice it, the shot that stood out for me was a tri-fold mirror image from a music box that featured a young girls face, the dancing musical ballerina, and the stars face, all in one frame. It looks great but it draws attention to itself. Also, the director let the star indulge in a lot of aside comments and laugh shots that go on too long. Some of it is funny but most of the time it hurts the narrative. The movie is supposed to be about action and character. There are some good character performances in the movie. Jack Weston, a rubber faced actor with a soft voice plays a Department of Justice investigator that traps our hero into working for the law against an old friend from his moonshining days. You'll recognize Weston from a ton of films. I always liked him as the agent in Ishtar but you will have seen him elsewhere. In the opening part of the movie, he is playing the part as a bumbling fish out of water type, and the comedy boat chase in the first fifteen minutes will make you think that Dom Deluise must simply not have been available. As the movie progresses, it is clear that they needed a dramatic actor for some scence as well as the comedy. Weston can do that, I don't think it would have worked with Reynold's usual comic foil. Jerry Reed on the other hand is in this movie, as he was for a half dozen other Reynold's films of the time. He does the title tune, after all he was primarily a country singer, but I thought he did very well playing a nasty bad guy. He's a good ole boy in a lot of scenes but then, he turns brutal and carries it off pretty well. Other than some awkward film-making my biggest issue with the movie is the tone. The opening is like a Smokey and the Bandit Comedy. It looks like Gator and the fed will have a Mutt and Jeff type comic banter for the duration. Somewhere along the line the though, the story turns serious, and although there is quite a bit of humor, it doesn't always play well next to the grittier stuff. For example, Alice Ghostly appears as an eccentric local who can help out the investigation. There is a section in which her love of her cats is played for laughs, but later in the film that idea becomes tragic and the fun good times get lost. The same sort of thing happens with the local Mayor and the corrupt police. It is all fun and games, and then there are fifteen year old girls strung out on drugs and used as prostitutes, with the officials turning a blind eye. The movie can't decide if it wants to be a slap-stick like comedy or a gritty crime thriller. Other movies have walked that line successfully (Beverly Hills Cop) but manage to do so while making the comedy stand separate from the crimes that are going on, here it does not feel that way. A running joke about a tall henchman having to sit in the drivers seat of the car while his head pops out of the sunroof is amusing, until that character turns out to be a sick killer. I spotted Burton Gillian again in this movie, as Smiley, the tall guys buddy. Mike Douglas of all people makes a cameo in the opening as the Governor that hopes cleaning up the crime ridden county will clear his way to a Presidential Nomination. Those of you who don't know Mike Douglas, he was one of those avuncular talkshow hosts, whose syndicated programs filled afternoon TV time on local network affiliates in the 60s and 70s. I think it was his show where Cher and Gene Simmons (in costume) were shown ordering tacos at a Jack in the Box. Model Laureen Hutton, is the female co-star here and it was funny watching her make light of her gap-toothed smile in a romantic encounter on the beach. I seem to remember a song or a story that talked about the allure of gap-toothed women, she was fine and pretty appealing here. My copy of the movie starts full screened, then goes to wide screen for the credits, back to full screen for the duration of the story and then wide-screen for the closing credits. I know there are contractual issues on the credits, and that is why they run them this way, but it makes it more noticeable how inadequate the pan and scan process is, because we have seen glimpses of the bayou and the back roads in panavision glory and it just looks better. Check out the movie poster above, it looks like James Bond became a hillbilly for this film. It's a great poster, but not really indicative of how the movie plays. Bond was smooth and polished and the action was choreographed really well, this movie is rough around the edges, with a lot of dirt in the story and on the actors. 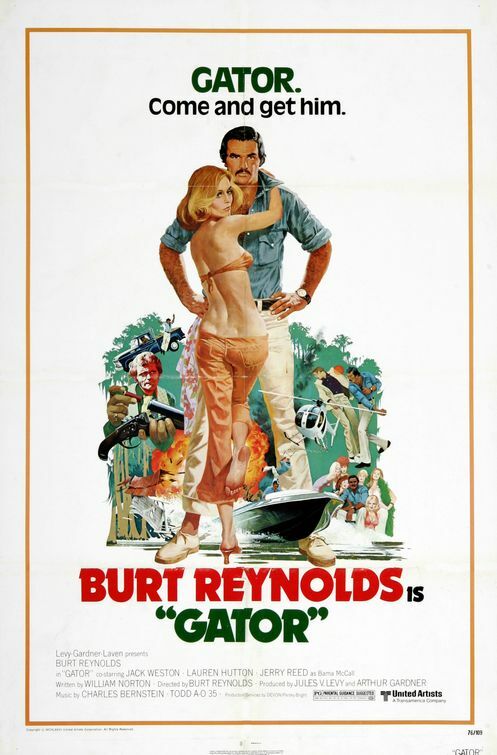 Typical Burt action film.